Do you like Alanis Morisette? I’m a fan. Her lyrics are awesome and the music, the music is just right. I wish we had more music artists making texts like that. And her style, 60’s and all (the long hair and simplicity), just reminded me on these days (no I was not born yet), these days, sixties, when everyone was talking about love and peace, they kind of inspire me. That was a huge movement. And I kind of appreciate the idea the movement was standing for. It is universal. It’s spiritual and it’s inspiring. 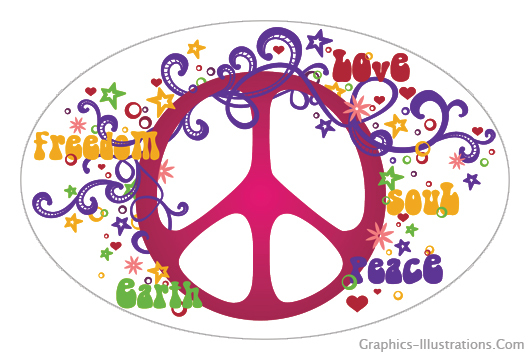 So, by now you guessed, today I want to share with you a “Tribute to 60’s” graphic”. It is a blog about graphics after all, but I hope you don’t mind me sharing some other thoughts, it is all interconnected after all. Now, I am not sure if I am allowed to share Alanis Morisette video from YouTube on my blog (although everybody seems to be doing it), but, however, I strongly recommend listening to her “Hand In My Pocket” it just drives me all day and I hope it will make feel good too.